Union Latina is a Latino culture club here at Highland. The group’s goal is to create a community at Highland where people can feel comfortable learning about the Latino culture and can celebrate it. 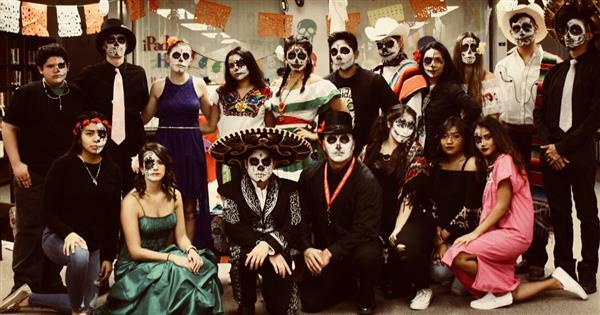 Two of their main presentations are: “Dia De Los Muertos” (Late October- Early November) and “The Cinco de Mayo Performance.” Practice for the performance, at the beginning of May, started the second week of January. This year, Union Latina made a change to their annual performance. The performance was previously referred to as “The Cinco de Mayo Performance,” but the club decided to change the name. The decision was made after the club had received feedback that the name didn’t fully capture what it was trying to portray. “Cinco de Mayo” refers to the Mexican holiday, but not all the dances and acts originated in Mexico, so it was decided that the name no longer fit the occasion. The club had a vote and the new name for the performance is “Fiesta Latina.” It will still take place in the beginning of May. The performance is used as a day to celebrate Latino culture and heritage while involving the whole school. Another change made to the performance is that one of Ms. Boe’s classes will be performing a dance, along with Ms. Nelson’s classes. This gave students, outside of the immersion program, an opportunity to be able to participate in the cultural event. When I went in to visit Ms. Boe’s class on Friday, a few of the students didn’t seem too excited to be there, but others were very enthusiastic and excited about the whole situation. All of the classes that are participating in the performance have practice every Friday in their classrooms. The other groups have practice for 1 hour on Wednesday’s during the ULA meetings. With only three and a half months left before may, we should wish them good luck!